As Kodi Whifield presented his final sports product design project for fall term, his classmate Garrett Tollette stood behind the others in the room and sketched. Whitfield went through his product pitch, describing the history of American football, the athletic nature of various positions, the need of offensive linemen to wear a specialized cleat, and the product development process. By the time he was finished, Tollette had drawn the shoe. Whitfield and Tollette met just three months before, part of a now tight-knit cohort of six who are the first students in the University of Oregon’s new sports product design master’s program in Portland. The program focuses on the creation of innovative sports products through research and design and prepares students to be key members and leaders of multidisciplinary development teams within sports product companies. Though initially drawn to the program by its hands-on nature and the ability to work closely with innovators within the industry, the students soon discovered their varied backgrounds and design strengths created its own opportunity for collaboration. Several students in the program formed a team that won first place in the QuackCon in October, the country’s first collegiate sports and technology hackathon competition. Whitfield graduated from Stanford last spring with a degree in mechanical engineering and was planning to pursue an NFL career, spending a brief period with the San Francisco 49ers. When his football career ended, he talked to an advisor who suggested the UO program. “This was a chance to still live out my passion for sports. I will be able to help athletes instead of competing for myself,” he said. Tollette earned a bachelor’s degree in the UO’s product design program, graduating last spring. And while he had job offers to work in furniture design, he knew the new master’s program was right for him. 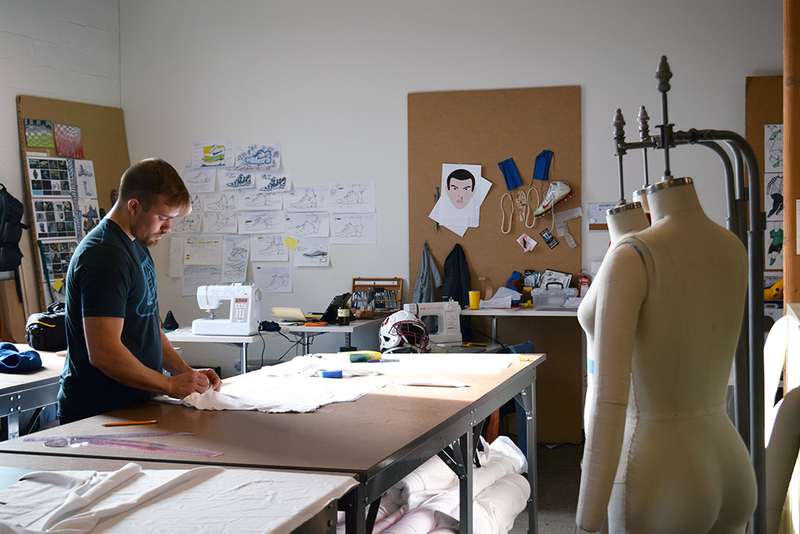 Other students already had accomplished design careers before joining the program, noting the draw of Portland and its designation as the national hub of sports product companies. The two-year master’s program focuses on innovation methods, design for the athlete, product sustainability and sports product marketing and branding. Drew McGrath spent eight years designing, fabricating and installing exhibits at the Oregon Historical Society in Portland. He was ready to explore other types of design and gain experience in project management when the UO program became available. Irving Perez was “discovered” on Twitter. Passionate about soccer and social issues, he worked for an immigration nonprofit in Texas that helped undocumented children from Central America. His hobby was drawing soccer jerseys, which he posted to Twitter. After he posted a design for the Jamaican national football team, he was contacted by the team’s sponsor and hired to design the 2015 kits for the Copa America and Gold Cup tournaments. The sports product design master’s is a two-year program in the UO School of Architecture and Allied Arts. Students admitted to the program learn about research and design processes related to sports footwear, apparel and equipment. Industry mentors serve as advisors, helping students develop a thesis project that includes researching and innovating a news sports product concept. Review of applications for the fall class will begin Jan. 15.